With a stay at Markham Court, you'll be centrally located in Broadbeach, a 8-minute walk from Gold Coast Convention and Exhibition Centre and 11 minutes by foot from Surfers Paradise Beach. This apartment is 1 mi (1.6 km) from Pacific Fair Shopping Centre and 1.7 mi (2.8 km) from Cavill Avenue. Make yourself at home in one of the 27 individually decorated guestrooms, featuring kitchens with refrigerators and ovens. Rooms have private balconies. Cable programming and DVD players are provided for your entertainment, while complimentary wireless Internet access keeps you connected. Bathrooms with shower/tub combinations feature deep soaking bathtubs and hair dryers. Enjoy recreation amenities such as an outdoor pool or take in the view from a garden. Additional features at this apartment include tour/ticket assistance, a picnic area, and barbecue grills. Markham Court features an outdoor pool, tour/ticket assistance, and barbecue grills. 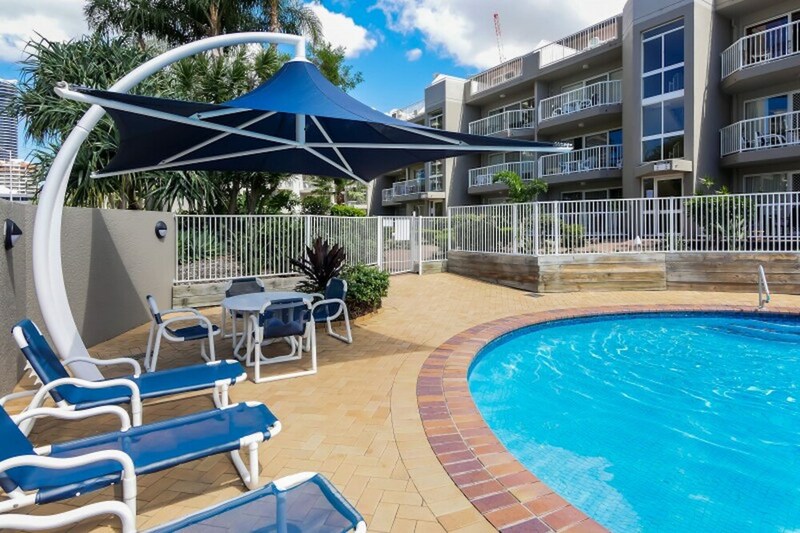 This Broadbeach apartment also offers a garden, a picnic area, and laundry facilities. The property has a front desk available during limited hours. Markham Court is a smoke-free property.